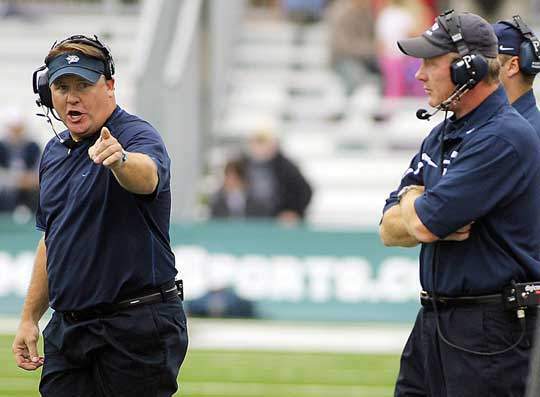 Nov. 25, 1963 — Charles “Chip” Kelly is born in Dover, New Hampshire. People who own time machines in the year 2044 rejoice. So do his parents. Rumored to make his first pointing gesture at the delivery doctor in congratulations for a flawless delivery. May, 1990 — Chip graduates from University of New Hampshire after a career as a defensive back. June, 1990 — Chip is hired by the academically prestigious Columbia University as a secondary and special teams coach. Fall/Winter of 1993 — Chip takes the job as… defensive coordinator at Johns Hopkins University. He is presumably frustrated by the glacial pace of opposing offenses. Summer of 1994 — Chip returns to his alma mater as a running backs coach. Begins pointing more. Spring of 1999 — Chip is promoted to the position of offensive coordinator, a position which he holds until 2006. Winter of 2006/2007 — Chip, after accepting that New Hampshire can no longer contain him, accepts the same position at the University of Oregon under head coach Mike Bellotti. March 31, 2009 — Bellotti is named the University of Oregon’s athletic director; Chip is promoted to head coach. January 1, 2009 — Chip loses his third game of the season, a 26-17 Rose Bowl defeat at the hands of Ohio State. Oregon finishes 10-3, and they’ll lose just four more games in the next three years. January 10, 2011 — Auburn RB Michael Dyer’s body (somehow, someway) never touches the ground after a Kenny Rowe tackle, and Dyer sprints for an extra 35 yards, setting up the National Championship winning field goal for Auburn. There is much sadness in Eugene, but the sadness is seasoned generously with optimism. September 3, 2011 — Oregon loses to a #4 ranked LSU team to open the season after a Honey Badger wreaked havoc on the Ducks for three straight quarters. November 19, 2011 — Alejandro Maldanado misses wide right on the game-tying field goal attempt that would have all but secured a second straight National Championship berth for Oregon. Again, there is much sadness in Eugene. January 23, 2012 — Chip takes a mysterious flight to Tampa Bay, where he accepts the head coaching gig then breaks up with the job within 12 hours. It’s like a middle school relationship for grown-ups. November 17, 2012 — Alejandro Maldanado misses again, but this time its Chip’s scheme that fails. Oregon’s National Championship hopes are dashed, as well as their Rose Bowl hopes. He looks like a zombie-raid survivor from the movie 28 Weeks Later during the post-game press conference. December 1, 2012 — Stanford beats UCLA handily, firmly extinguishing Oregon’s National Championship hopes. December 2, 2012 — Oregon receives bid to play Kansas State in the Fiesta Bowl. 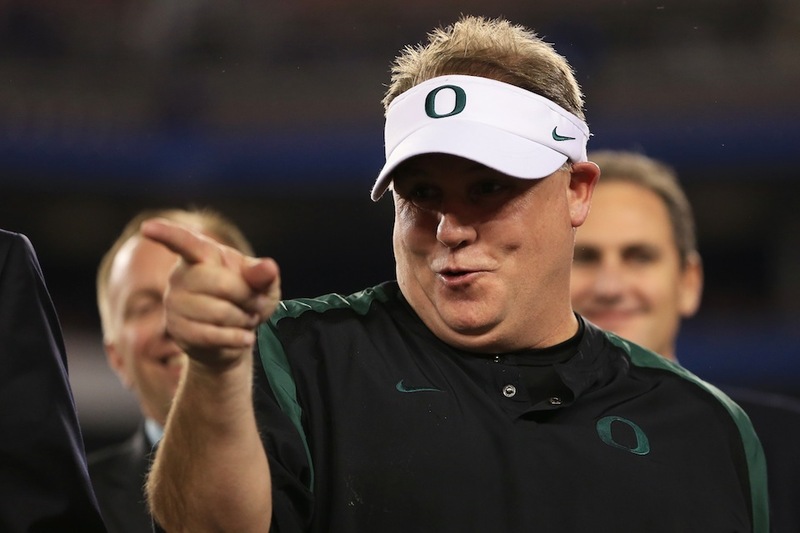 December, 2012 — Rumors begin swirling that Chip is leaving the University of Oregon, and soon. These rumors go unsubstantiated, because, well, Chip doesn’t talk about anything of consequence. January 3, 2013 — Oregon destroys Kansas State in the Fiesta Bowl. Chip Kelly flies to Cleveland to interview for an interview with the Cleveland Browns. It is also reported that Oregon offensive coordinator Mark Helfrich will stay at school if Chip decides to leave, allowing the people of Eugene to collectively wipe at least one layer of sweat from their collective brow. January 4, 2013 — Chip declines the Browns offer, flies to Buffalo. Interviews with the glamorous Bills. January 5, 2013 — Chip also declines the Bills offer, flies to Philadelphia. Things look bad for Ducks fans. January 6, 2013 — Everything is well, or so it is reported. Chip declines the Eagles offer, decides to come back to Eugene. Eagles begin to pursue Notre Dame head coach Brian Kelly in addition to Gus Bradley. January 10, 2013 — Oregon’s basketball program knocks of undefeated and fourth-ranked Arizona with Chip Kelly and Nike founder Phil Knight in attendance. They are not sitting together. Chip looks pensive throughout the game. January 15, 2013 — The weather in Eugene is about 15 degrees colder than predicted. January 16, 2013 — Again, the weather in Eugene is about 15 degrees colder than predicted. Chip Kelly informs the University of Oregon that he will accept the Eagles offer, Chris Mortensen breaks the story on the 9 a.m. SportsCenter. The entire town sheds a single tear. Chip points during his interview.